The star Vilio has collapsed into a black hole rendering the nearby space mining ships, colony cruisers, and special forces fighters without power. Only the Quarp Jet is capable of a rescue operation because it has the power to teleport. Unfortunately the mission is further complicated by the invasion of a neighboring race. Moreover the ships can only be rescued after disabling their shields. The shields can only be disabled through circuit breakers. The circuit breakers are scattered, and must be deactivated in the correct order. In Velocity the player takes on the role of the Quarp Jet. They must find the station, disable their shields, and rescue the stranded ships. Concurrently they must also battle with the invading race, the Zetachron. Velocity is a shoot 'em up video game developed by FuturLab for the PlayStation 3, PlayStation Portable, and PlayStation Vita as a PlayStation mini. 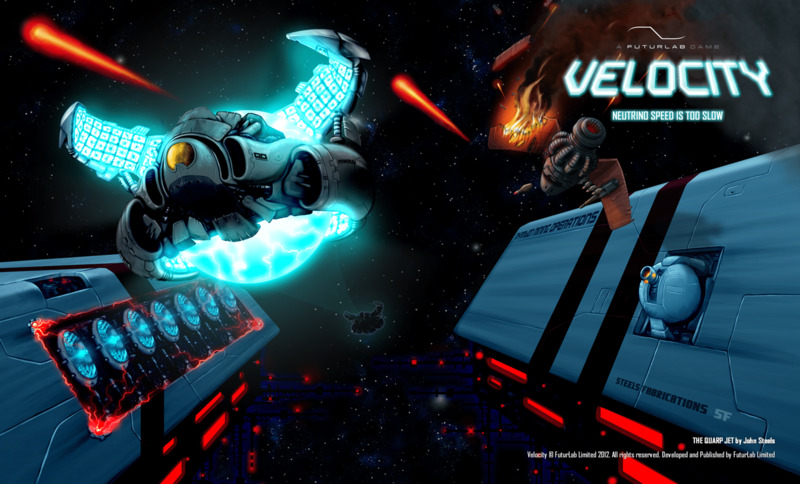 Velocity '​s gameplay involves navigating the Quarp Jet – a teleporting spacecraft – through space, whilst avoiding and defeating enemies using bombs that can be flung in cardinal directions. The main goal of the game is to rescue stranded ships. The game adds depth by introducing new abilities and obstacles. The stranded ships are protected by shields that must be disabled by switches in a specific order. The player's ship has the ability to fire bombs. The game allows the player to teleport their ship anywhere. It also allows the player create telepods which they can return to anytime. The telepods add a puzzle element to the game because the player has to return to activate the switches in the right order. Velocity is hands-down the best PlayStation mini I’ve experienced. Any fan of space-shooters or even of action games in general should strongly consider it. - Hold R to scroll the screen more quickly. All levels scroll vertically upward, but this lets you increase the scroll speed. Some levels have a short time-limit, requiring you to boost most of the way through. - Hold Square to move a reticle for teleporting. Used to bypass obstacles, jump over a swarm of enemies, etc. - Press Circle to launch a bomb in the direction you last moved. Used for destructible obstacles and to decimate static enemies or tight groups of moving enemies. - Press Triangle to drop a telepod. At any point, you can press L to bring up a map of the level, then move the cursor between telepods, letting you jump back to an earlier part of the level. Necessary when splits occur in a level. Telepods are limited to a certain number per level. Further complicating matters are color-coded security systems. Each one generates an instant-death laser field, and can only be disabled by attacking numbered switches in order. Telepods often come in to play with these, requiring you to backtrack in a level in order to trigger switches that you passed up earlier. The point of all this is that a star has gone black-hole and is eating up your employer’s mining operations. You must navigate the Quarp Jet through collapsed levels, rescuing miners and scientists stranded in escape capsules. You need to grab a minimum number of capsules in each level. One nice feature Velocity has that most space-shooters don’t is that you can run into walls without taking damage. That was an excellent design choice, because with all the speed-scrolling, teleporting, and narrow corridors, the game would be nearly impossible otherwise. Also, your ship has a life meter, so you can take several hits before dying, and you can even refill your health via in-level items. The game also has a bumpin’ soundtrack. It’s impressive for a space-shooter in general, let alone a mini. Oddly, it will sometimes cut out between levels, but it’s always there when you’re actually playing. My only real complaint about the game, and this is kind of a big one, is that difficulty is forced towards the end. You get experience (XP) based on how well you do in a level, and each level has a minimum XP requirement in order to play it, meaning you will eventually have to go back and play prior levels to get more XP before being able to beat the game. I was disheartened to see this, because otherwise you could make your own difficulty on the fly by being content with Bronze or Silver on a level, but as it is, you’ll have to revisit levels to get Gold and additional XP. Even with forced-difficulty, this is a stellar title. Between the 50 levels, unlockable missions, a Minesweeper-type game, and the cheat codes and numerous other extra goodies, you’ll get a lot of top-notch entertainment for your money.